Happy April! I am so excited to start this month off with a post that is a little different... In a fantasy world, I would have at least 3 outfit changes a day (morning/day/night) if I could. In reality, I don't have a wardrobe on wheels or simply time to do so. Sometimes it's even more difficult when I have to go somewhere fancier at night after being out and about all day. Not only do I not have time to go home and change but I also can't lug around another separate outfit with me all day long. My solution? A piece of clothing that can easily be transformed from day to night. This black cap sleeve semi-fitted dress from purplemaroon is the perfect example. During the day, I paired it with these incredible gladiator leather sandals and a floppy fedora hat. At night, I simply switched my bucket bag for a clutch, put on a pearl necklace and slipped into these stunning red heels with a bow at the ankle. This dress is made of a stretchy t-shirt like material which is so comfortable to be in all day, not to mention how much I love the unique strap that wraps from the front to the low u-back. It might be just another LBD but it sure goes a long way! Black cap sleeve dress c/o purplemaroon. Geri gladiator leather sandals c/o Report Signature. Becker shoulder bucket bag (sold out) c/o Foley + Corinna. Grande fedora hat c/o MuDu London. Stella McCartney tortoise sunglasses c/o Ditto. 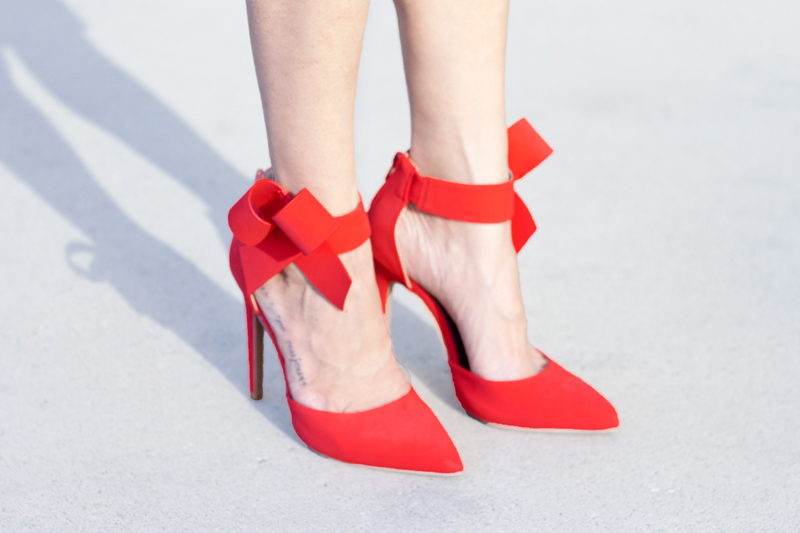 Red bow heels c/o Qupid. Giant twist lock clutch (sold out) c/o Lulu*s.
Metal cut out sunglasses c/o ZeroUV. You look amazing lady! Those shoes are drool worthy!